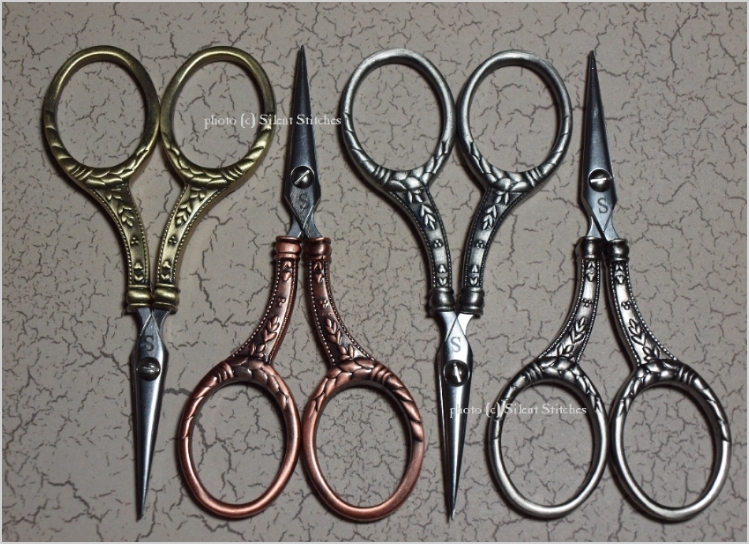 A selection of the finest scissors available! Collected from all around the world! We kindly ask that you DO NOT Copy our photos or descriptions by any method, for any reason! Our Copyrights are strictly enforced! 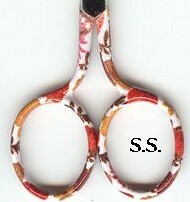 Please order by the Name/Title of the scissors. Click on the "How to Order" button for ordering information. 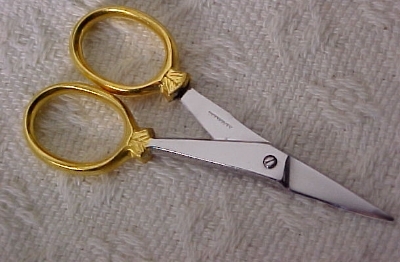 A drop from the table can damage the tips of an expensive pair of scissors...protect your investment! 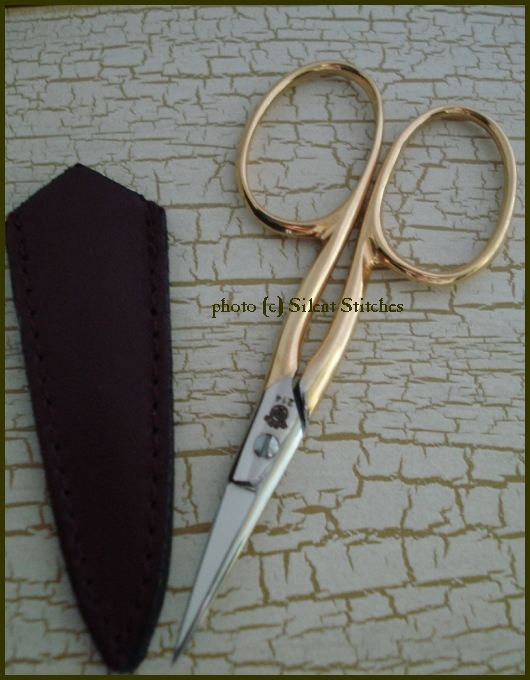 Scroll the page to see more brands of scissors sheaths. 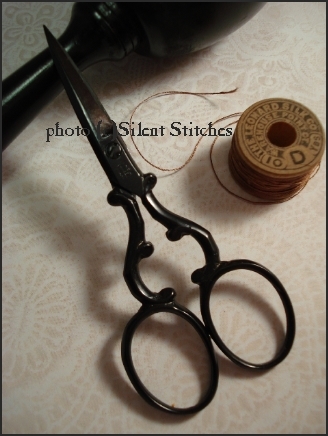 Silent Stitches Scissors Tips/Points Protectors! Click on the photo to locate these on the Goodes page. 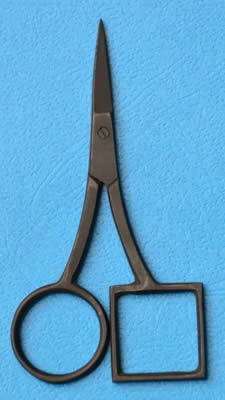 We have more scissors sheaths too! 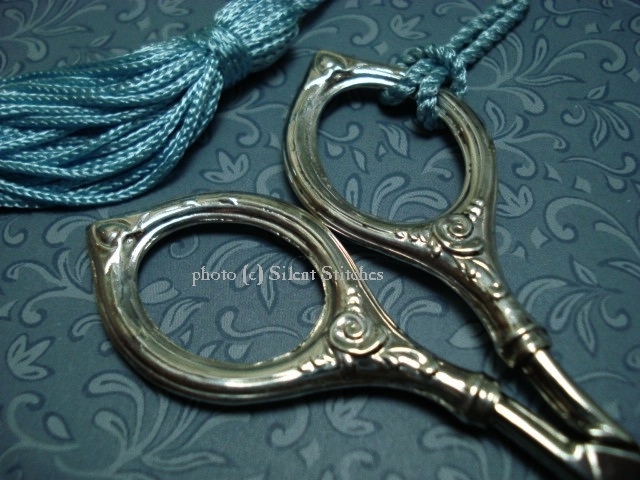 gingherâ Bohinâ & DOVOâ brand scissors sheaths are also available! Scroll the page to view. Overall measurements: 4" x 2.5"
This case runs small and may not be suitable for some scissors. We will be happy to check the measurements for you. 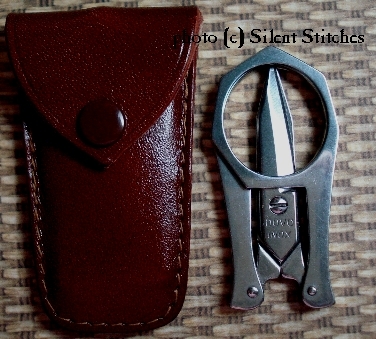 Offer full protection to your valuable scissors with this suede lined, leather zippered case. Impressive quality! 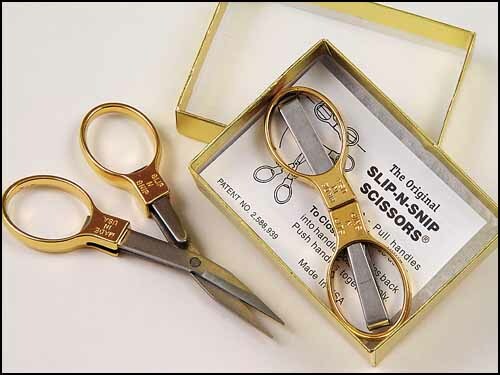 You won't have to worry about any damage to your scissors when they are safely stored in this case! Especially nice for those who travel. Plenty of room to store your needles, threader, etc. $28.95 Sold out until further notice. 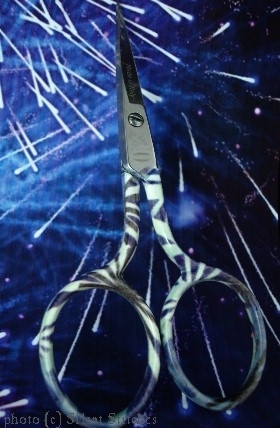 .....what all the best dressed scissors are wearing this year! 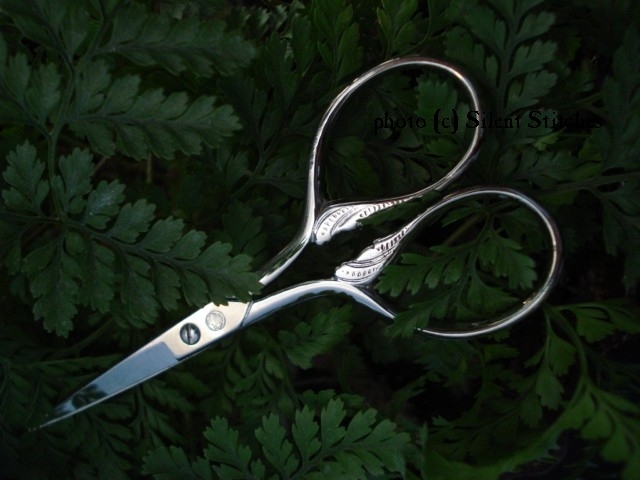 Adds an elegant look to your scissors and makes them easier to find. 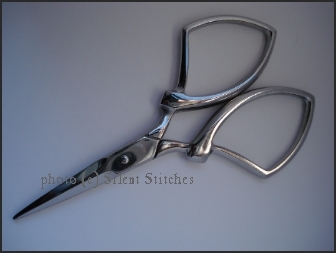 We prefer these because they won't scratch your scissors like some metal fobs may. Pictured from left to right. Make it extra special, make it a "Charming Adornment"! See below. We can add a sterling silver charm to any adornment for you! Ask for a CHARMING ADORNMENT TM! Let us know your *Charm Choice and Adornment color choice from above. Charm options: Click here to go directly to the Sterling Silver charms page to select your favorite one! If you'd like us to attach a charm, please ask for a "charming adornment" when ordering. 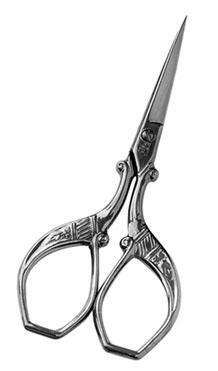 We are proud to offer you these fine BOHIN Scissors. Vinyl case with BOHIN logo. Beautiful colors, like that of an Abalone Shell! Shades of blue & green with hints of mauve. 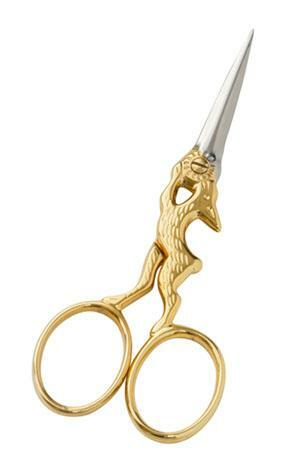 BOHIN 3.5" Gold Stork Scissors ...a classic! 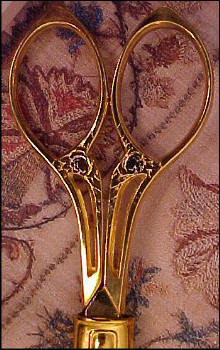 3.5" BOHIN Scissors with LARGE Gold BOWS! just 2.75" but get the job done! Includes a Vinyl Case with BOHIN Logo. 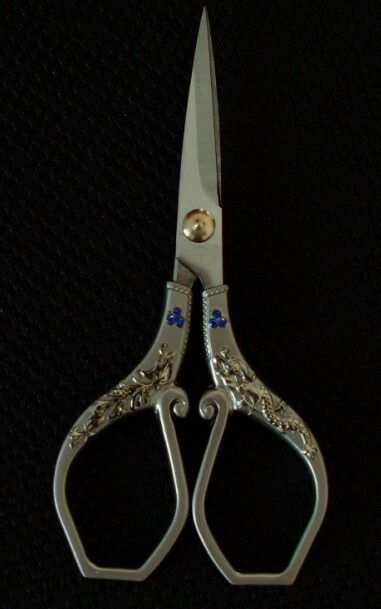 BOHIN engraved on the scissors blades. Don't let the size fool you....these cut! Curved "bends" just below the bows. 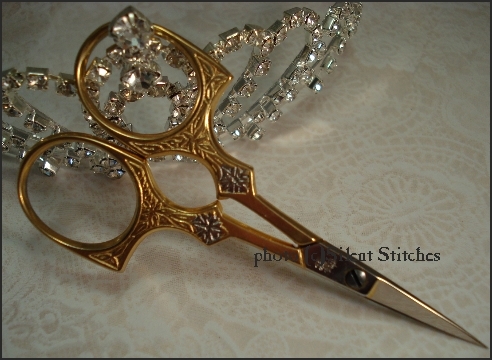 Sharp tips...for all of your intricate embroidery & sewing. Allows maneuverability for precise work. ^ Click on photo to enlarge. 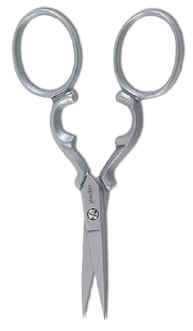 You don't have to be right to use these scissors...but you will be because they are great all-purpose scissors! 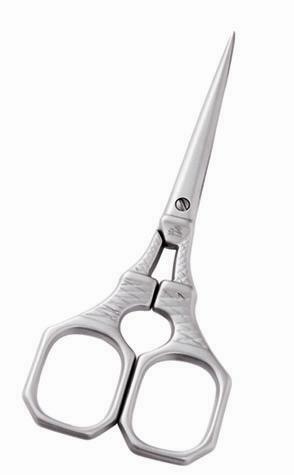 Measurements marked on the blades allowing you to cut and measure at the same time! Pure genius! Your choice of colors. Please mention when ordering. 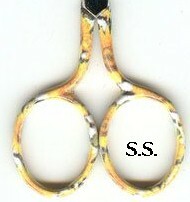 Scissors may be available in your choice of: Blue, White or Yellow! Please inquire. (Sold out until further notice.) Note: See Premax brand below, for a similar style. 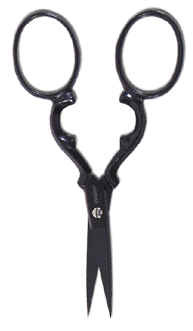 BOHIN ~Soft Black Leather Tip Protector for 3 ½ Scissors. 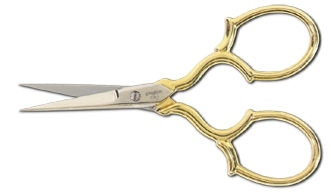 $6.95 each or $5.95 with each BOHIN Scissors purchase. 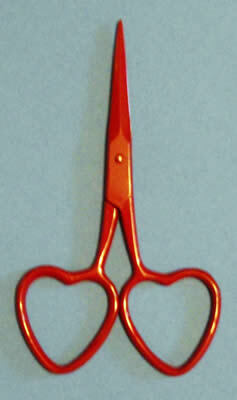 BOHIN 2.25" ~ROUGE~ Sweet Little Scissors! So small...perfect to take along! 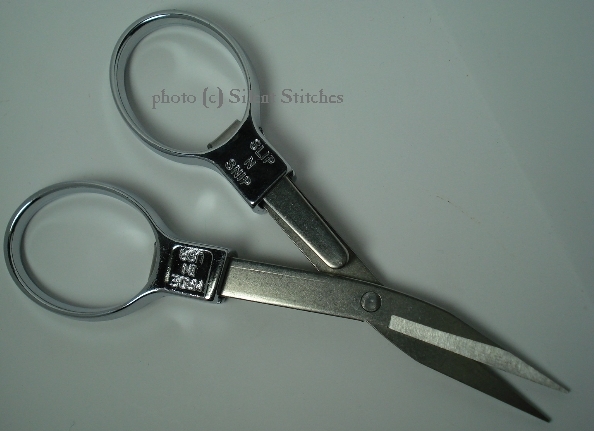 Handy all purpose scissors for your sewing or tool box! 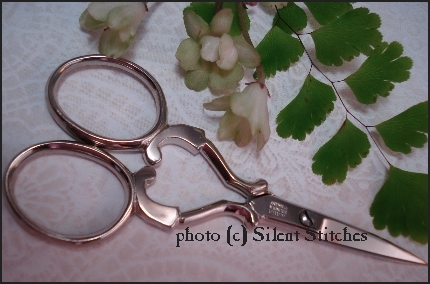 There are so many other Sajou Scissors styles and wonderful products available! Most can be ordered for you. View the catalog below to see them all! Handcrafted in Paris, France. 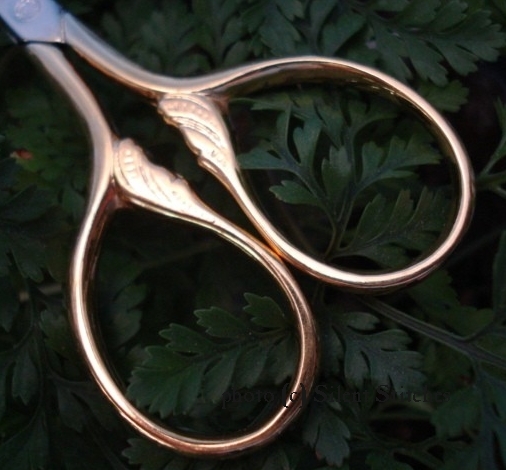 Each pair of scissors is crafted by 12 skilled artisans from start to finish. Inspired by Charles X styles popular between the years 1820-1830. Fine blades are numbered with pairing marks, a sign of quality and precise adjustment. 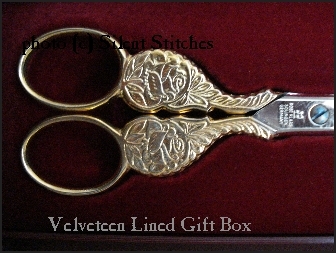 Your scissors will arrive attractively packaged in Sajou's custom designed box! 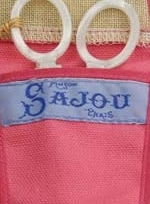 Please view the Sajou catalogue link below to view many more styles! 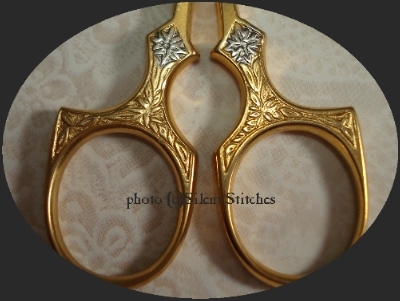 Sajou ~ Cart Scissors 4.75"
Once upon a time...a scissors maker designed a special pair of scissors for his beloved. The young lady adored her father, who delivered wood with his donkey cart. Sajou has recreated these with all the charm of the original. Arrive in a special gift box as shown above. 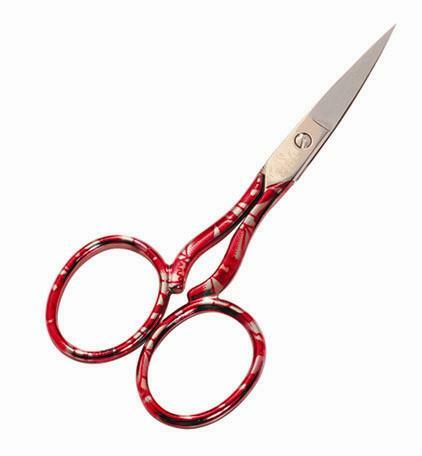 Red Onyx Scissors Case/Dark Sepia fabric with tan flap & red binding. Note: The cases are all the same size, and will fit all 7 scissors styles. Choose the suggested case mentioned above or choose your favorite color instead! 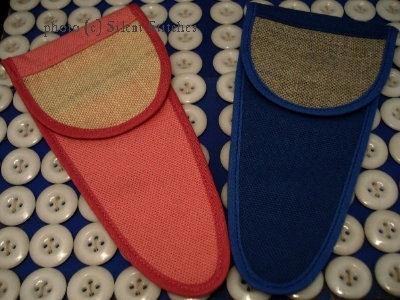 12 ct Linen flap may be embroidered! Make it yours...cross stitch your initial or favorite design! Note: Other items found on the Sajou website may be available by special order with *estimated 7 day arrival time for most items. *Import delays do happen, so please allow ample delivery time. Please mention the date needed by, when ordering. 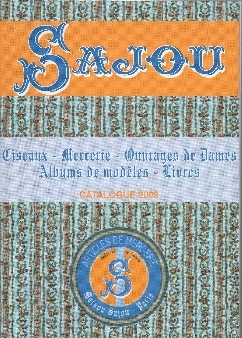 Click on the photo below Ê to browse the latest Sajou catalogue!! You will leave our website and go directly to Sajou's website. Return here to order. Just jot down the name of the items & page number & email your selections to us for a price quote or order. 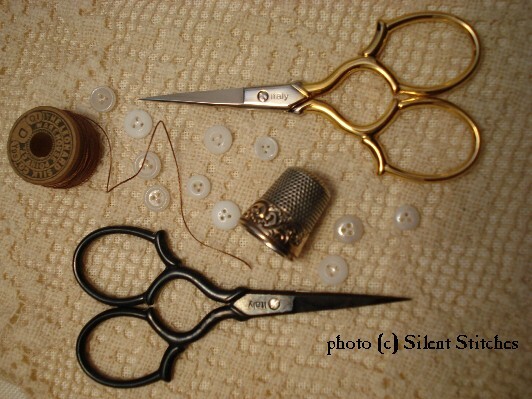 Sajou Thimble Boxes & Boutons Boxes can be found on the Thimbles Page & Fabric/Buttons Page! Click on the photos for more details! 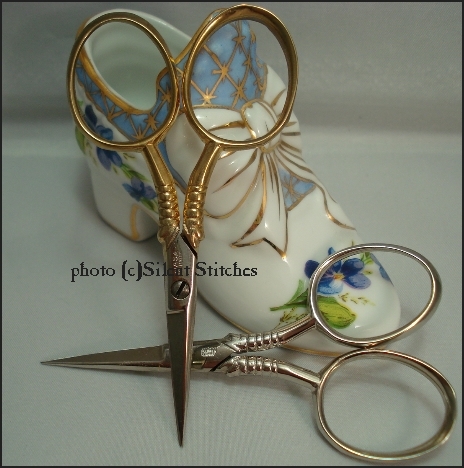 See all of the Sajou Scissors & Accessories at Silent Stitches! 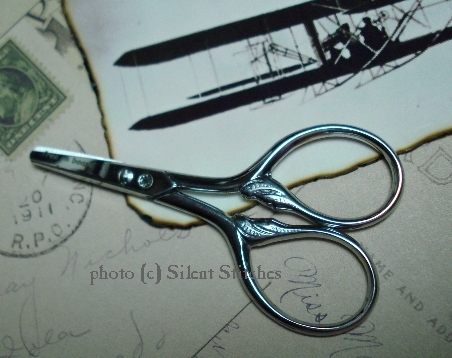 The Silent Stitches Signature Scissors Collection is now available. Click on the link for viewing. Hand-crafted in Nogent, France. 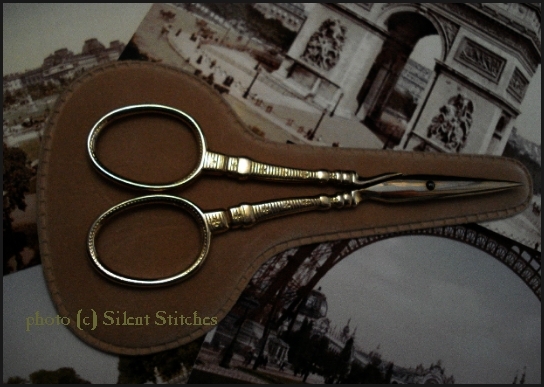 Made especially for Silent Stitches by JMR. Many hours of precision master craftsmanship goes into making each pair. Simply breathtaking! When you hold them in your hand, you will understand. Photos may not be actual size. Some enlarged to show details. These are individually handmade...each will have unique characteristics. No two will be alike, which only adds to the charm. Truly the ultimate scissors. Own these and be the envy of all! Will appreciate in value over time. Destined to be a family heirloom. Custom fitted wooden storage box included. 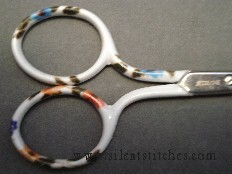 See the Silent Stitches Signature Scissors Collection. Click on the photo link above. We kindly ask that you do not copy our photos or descriptions by any method, for any reason. Not for use in blogs, pinterest, facebook etc. This policy is strictly enforced. Thank you. 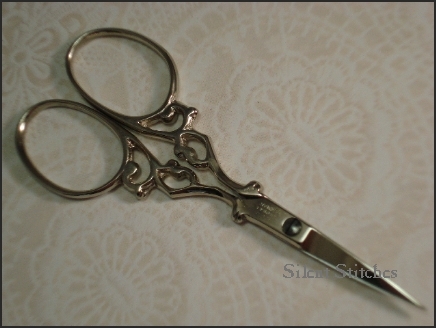 Scissors do not come with scissors sheaths unless mentioned in the description. We have several styles & brands available for ordering on this page. 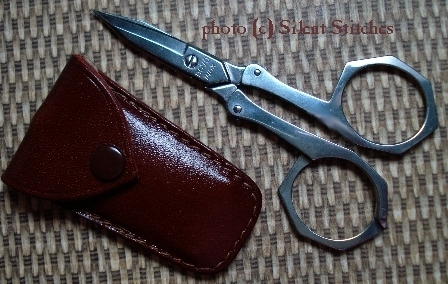 Special Bonus: A navy blue "Dovo" embossed leather scissors sheath, is included. 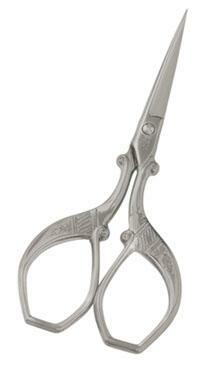 Scissors for those in their right mind! Suggested for school age children ages 6-8 with adult supervision. 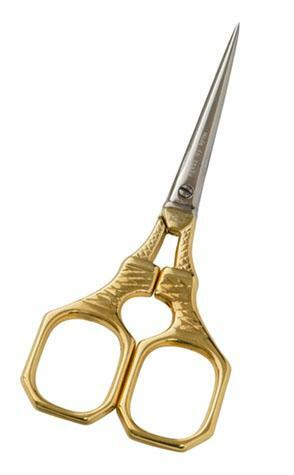 DOVO "Gold Splendor" 3.5" Embroidery Scissors! 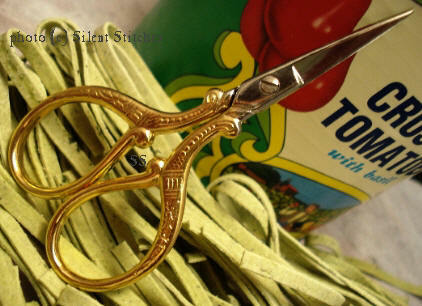 Our "Favorite" DOVO Embroidery Scissors! One round tip, one pointed. 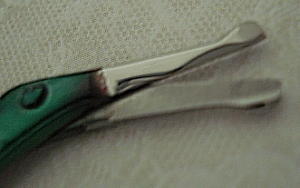 Thin blade tips with recessed blade on both sides. Just what you need for precise sharp cutting! 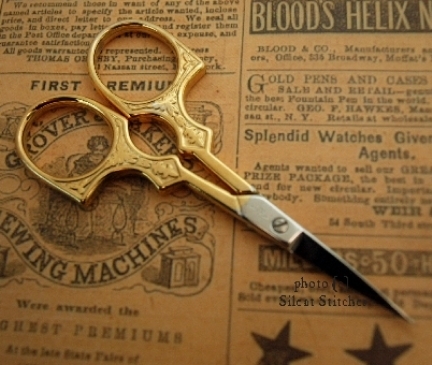 Celebrating over 100 years of quality scissors craftsmanship! Rounded tips make these just a 1/4" shorter in length than the standard size. Rich yellow gold. 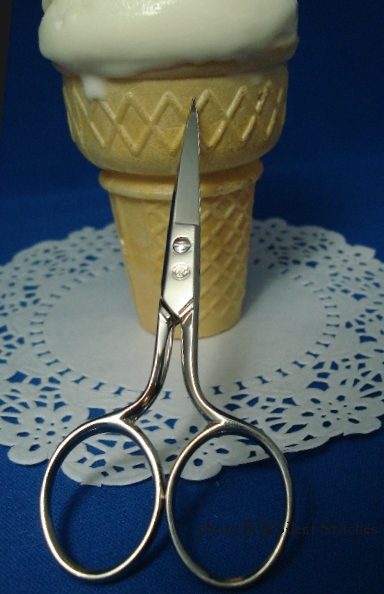 The sweetest little scissors! Made by master grinders from the finest hot forged special steel. Great gift for a Gentleman too! Heavy Duty! 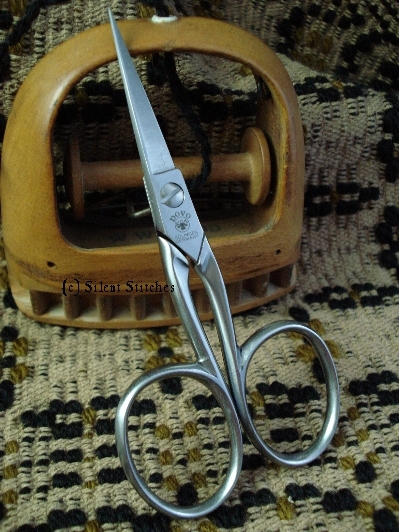 Perfect for cutting wool yarn, twine etc. Excellent gift for a lady or gentleman! Weavers, Knitters, Crafters...these are what you've been looking for. $59.95 Not available at this time. Because now and then... ....plain is all you need! Heavy Duty! 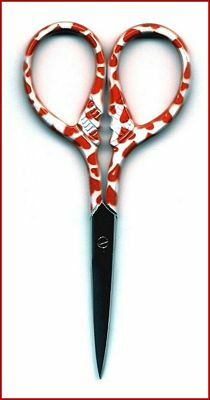 Fantastic everyday scissors. Put them to work! Photo shown above is close to the actual size. 7" Full Coverage Leather Case with embossed DOVO logo. 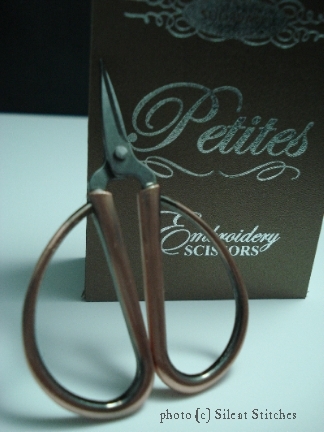 Now available in 5.5" Sewing Scissors too! 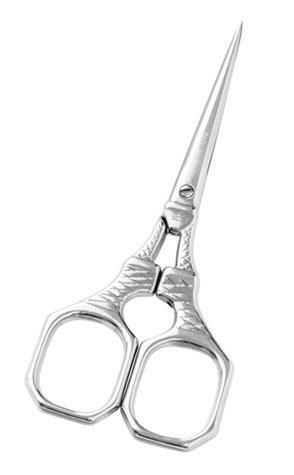 Now available: Nickel-Plated 5.5" Sewing Scissors! A Crucifix forms when the bows close. 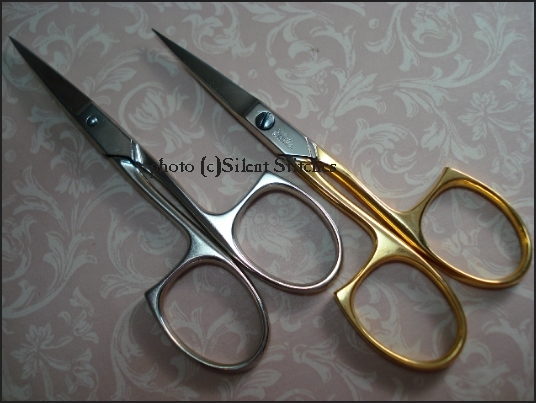 Precision-ground stainless steel scissor blades. Re-adjustable screw fastened with an additional nylon retainer. 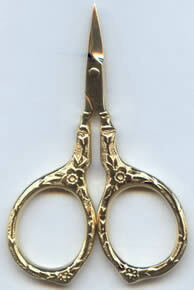 We are extremely proud to bring you these exceptional English Embroidery Scissors! Plated Carbon Steel construction, built to last! ....no two will be exactly alike! 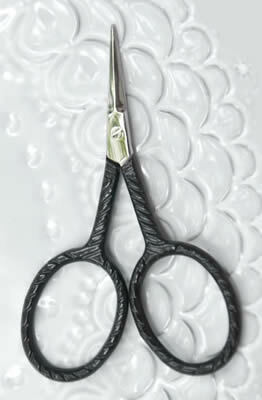 If you're looking for classic, exceptional quality scissors...you have found them. 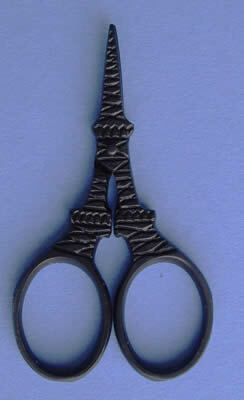 A full-coverage black leather scissors case is included, as shown below. Nickel-Plated Carbon Steel construction, built to last! 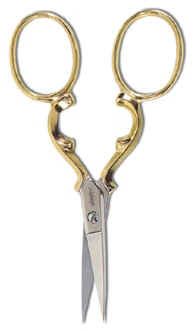 These scissors are a very hefty weight & have large bows. Perfect for a gentleman! Premium Quality Made in Italy for DMC Corp. 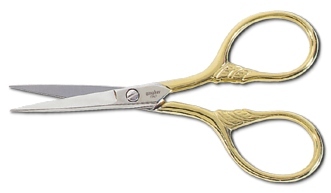 Decorative Gold-Plated Bows...we love the unusual shape of these bows! All colors may not be available. Please inquire before ordering. 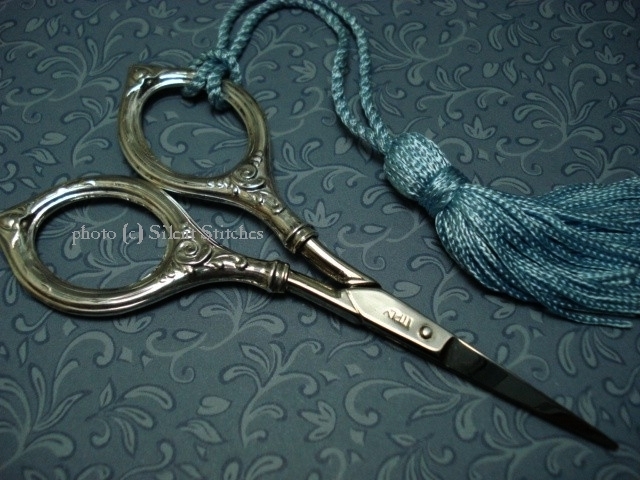 premaxâ Scissors from Italy are available at Silent Stitches! Steel construction, hardened & tempered. Ring-Lock is a patent pending assembly system which forever eliminates screw loosening. Out of stock. Please email your interest. 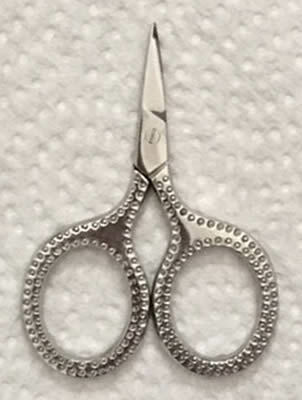 We think these scissors are especially fun! 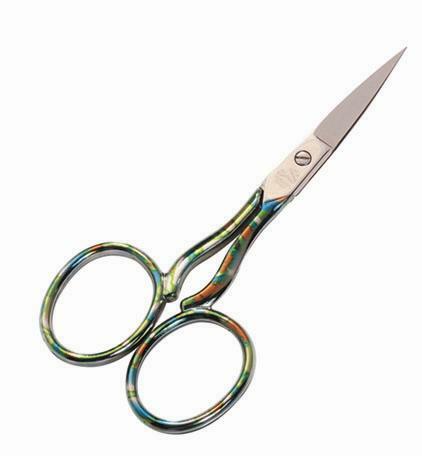 3 1/2" embroidery scissors from high carbon steel, precision hardened & tempered, nickel plated, and then finished in a special process which gives them a wonderful multicolor effect. Made in Italy. Colors may vary. Please mention if you have a preference. Tempered Stainless Steel for strength & blade sharpness retention. 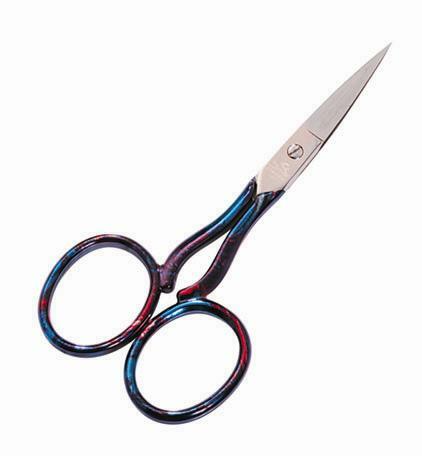 Are you looking for scissors with fine point precision? You have just found them! Photo enlarged to show details. Sold out at this time. 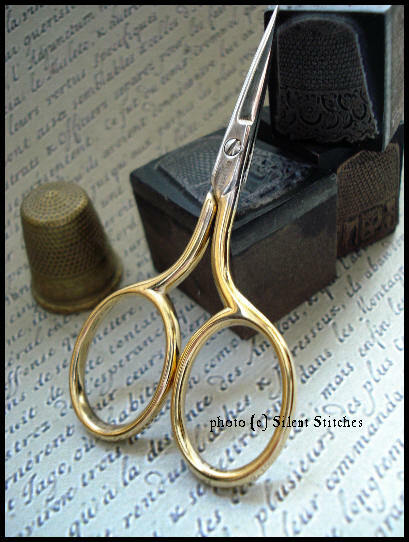 When working with metallic threads, you need a pair of scissors with a serrated blade that will grab your thread and cut precisely. 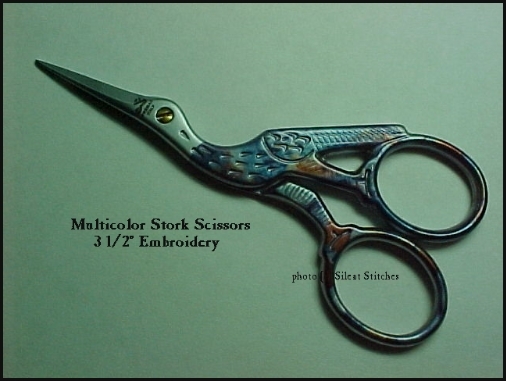 If you are using your expensive embroidery scissors to cut metallic threads, STOP! you are dulling the blades! 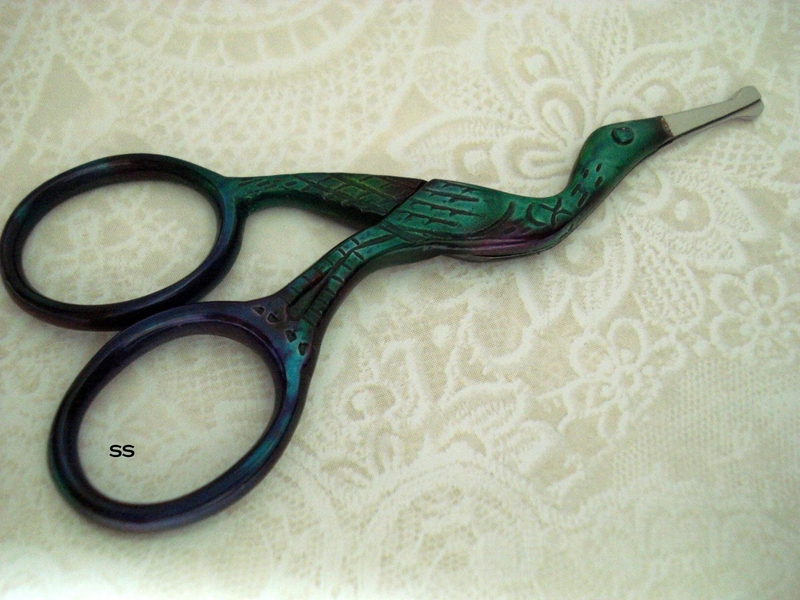 3.75" Craft Scissors ~ Perfect for Quilting, Embroidery, Knitting, etc. Heavy weight, quality construction...made to get the work done! 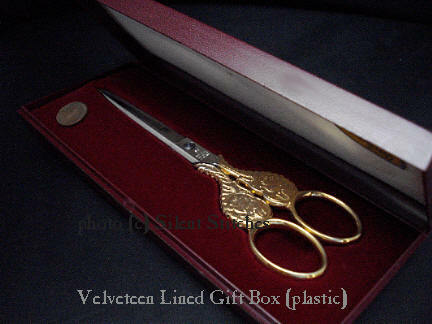 Included: Black Leather Scissors Sheath & Clear plastic gift box. Hand-crafted of specially selected imported glass and silver beads with a MOP floral accent. Hurry...only available while supply lasts! 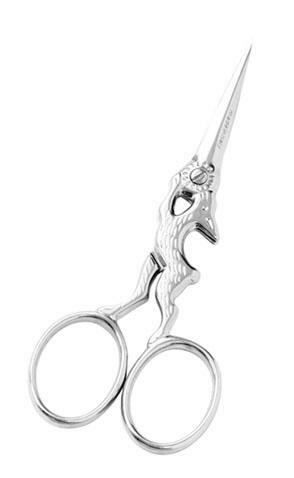 *Note: The adornment is available only with each purchase of ® Eleanor Scissors. It may not be purchased separately. The word "adornment" is trademarked by Silent Stitches and is protected by law. Please respect our property. Hand-crafted of specially selected focal bead, imported glass beads & sterling beads. 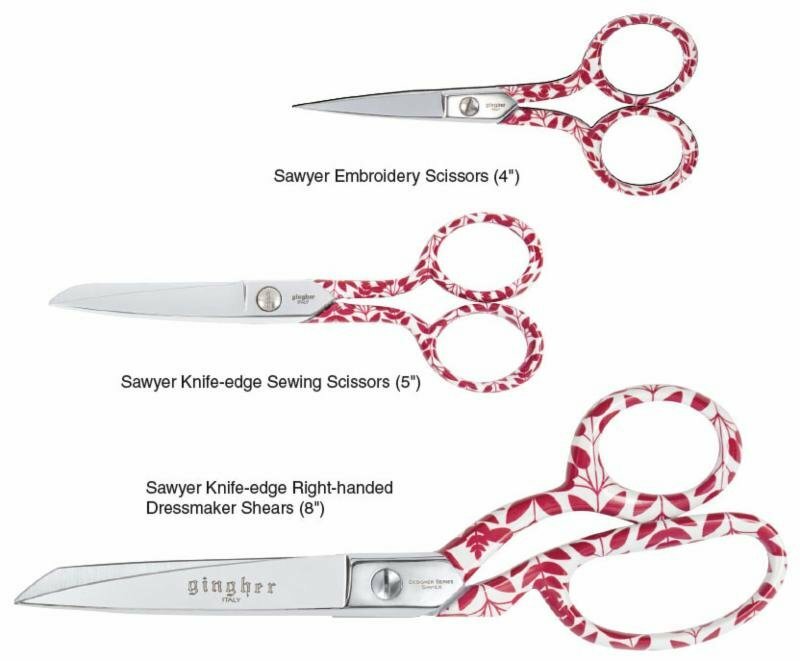 Sawyer 5" Sewing Scissors and/or 8" Dressmaker Shears, may be special ordered, while supplies last. Please allow 4 days. 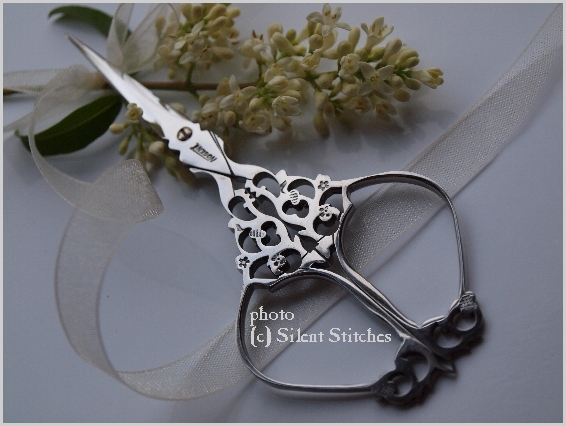 THE EXCLUSIVE Silent Stitches® "WREN ADORNMENT"
2015 Limited Edition / SOLD OUT ~Thank you! 2014 Gingher Designer Series "Eve"
Perfect for appliqué work and rug making. 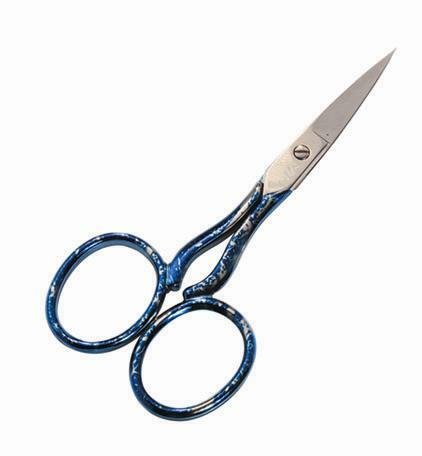 These scissors have a paddle-shaped blade to push away the bottom layer of fabric for controlled cuts. 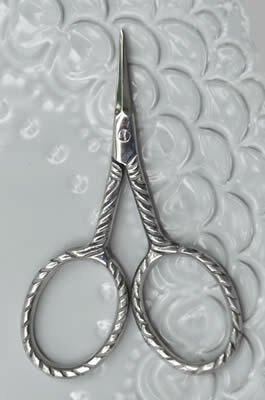 Double-plated chrome-over-nickel blades. 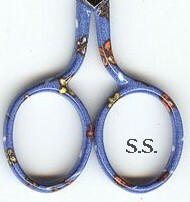 Offset handle for comfort in use. Exceptional Quality. Highly recommended by Silent Stitches. We may be able to order other ® styles for you! Sadly, has discontinued these. They are no longer available. 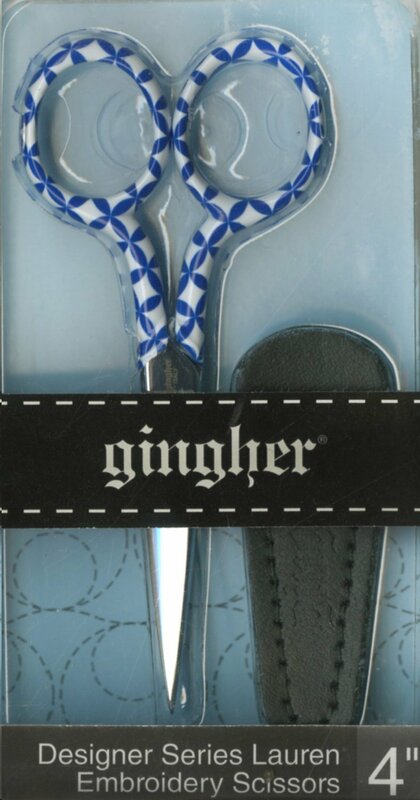 For all of your gingher scissors! 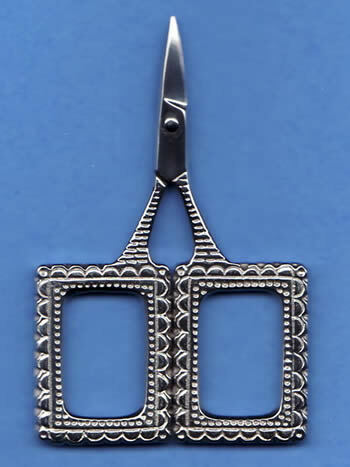 Currently available in Gunmetal Finish, as shown on the right. 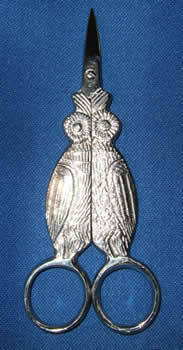 Perfect accessory for your primitive designs! These would make a sweet little gift! Order in your choice of colors: Silver, Copper or Gold (not shown). 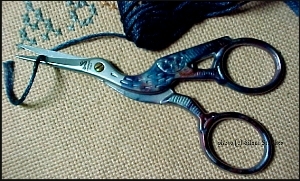 Hefty weight...at 1.5 oz., these are almost double the weight of most embroidery scissors! Stainless Steel Blades with sharp points. 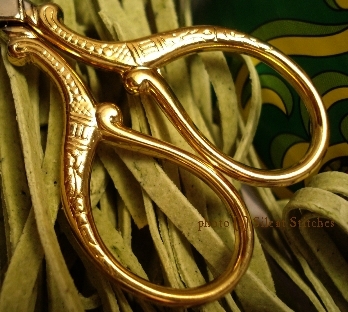 Pretty "vine design" embossed metal handles. Your choice of 4 finishes! 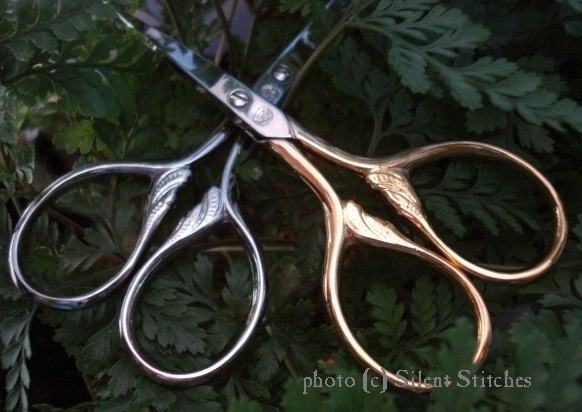 Pretty "vine design" curved embossed metal handles. Your choice of 3 finishes! A modern interpretation of an Eighteenth Century design from our collection! Great conversational piece to be sure! Sold out forever! Maude says, "Thank you everyone!" So pretty...sure to make you smile. Made especially for us....for you. Perfect for a sophisticated lady! Made and packaged for Sullivans. Stamped "S". 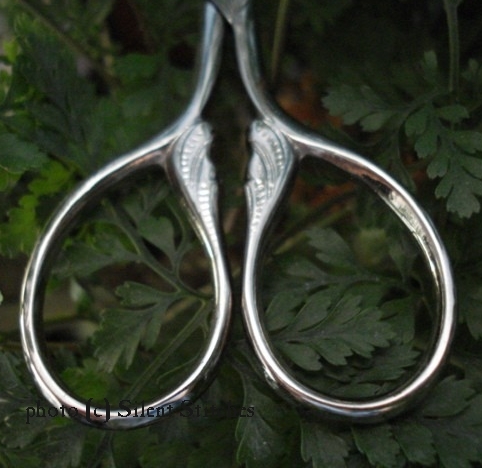 If you're looking for extremely primitive scissors...you just found them! 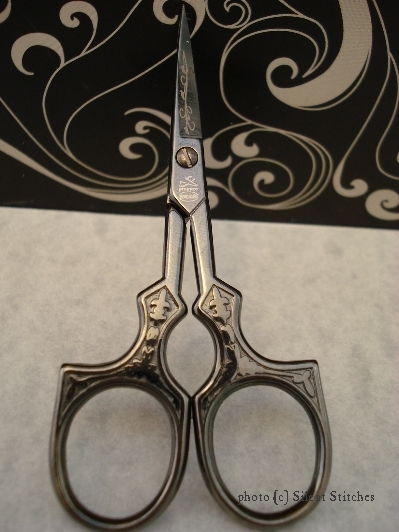 These little snips measure in at 3.5"
A conversational piece for sure! 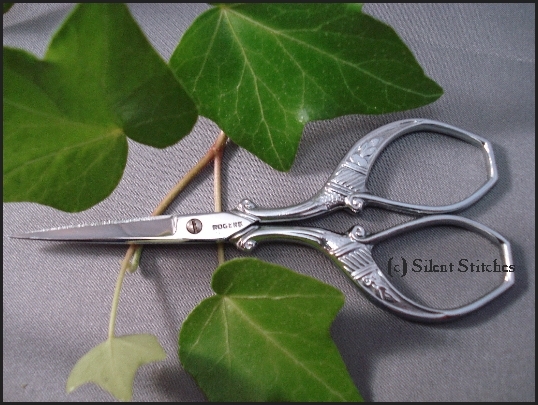 These would be great little bonsai trimmers too. Extremely HEAVY DUTY Solid construction!! Made especially for us...for you. Sorry, sold out. We don't know when these will return. Please check here for updates. Available in silver-tone or gold tone. Inspired by an antique design. 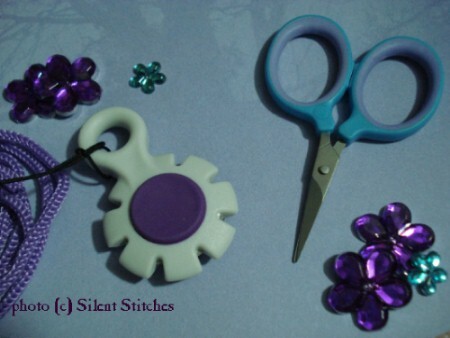 Do you collect sewing items with a fish theme? 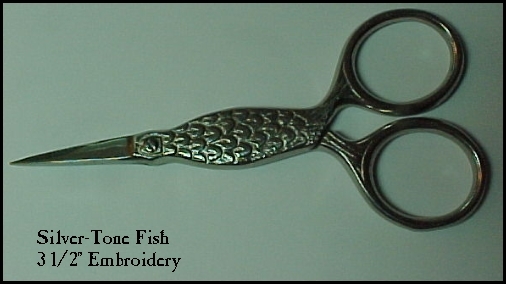 We may have fish scissors, fish laying tools, sterling fish threaders & fish needle cases! Pink, Blue, & Green! Email for available choices. 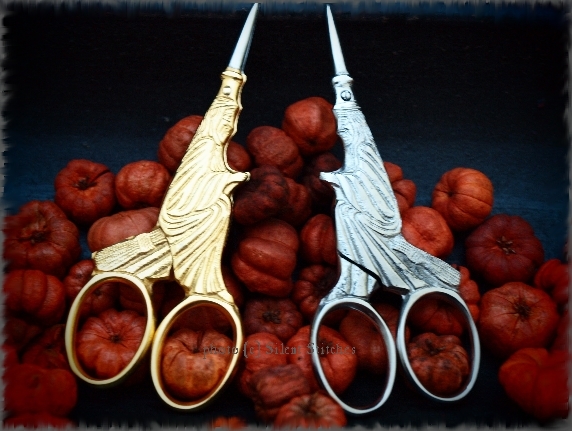 Stainless Steel Blades with your choice of either Gold or Silver handles. Note: Currently Available in Silver-tone only. 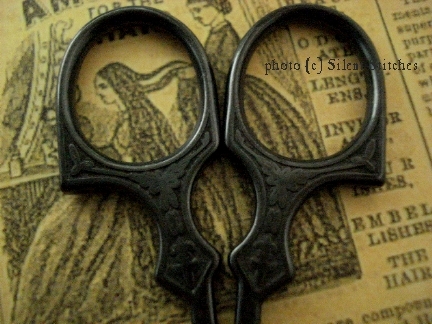 Victorian Style sewing necessity! 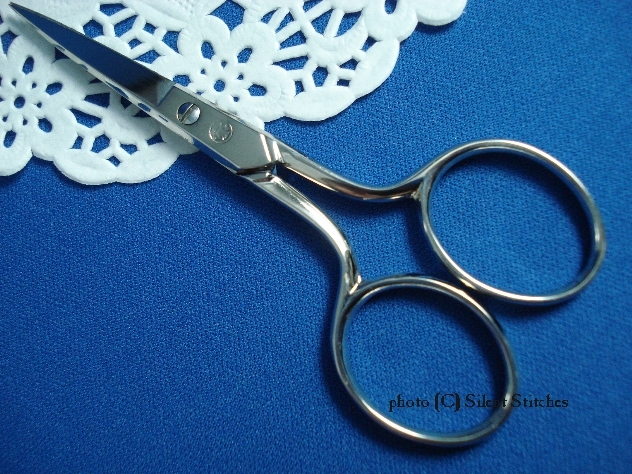 Always have your scissors with you! 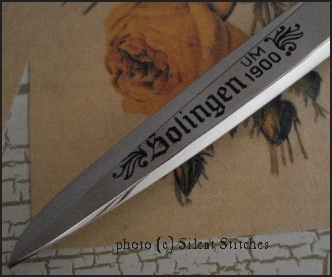 Hallmarked: Pewter. 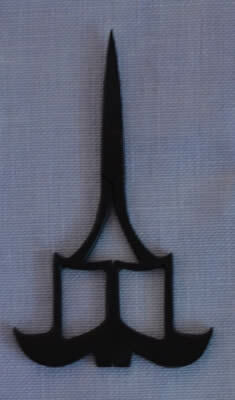 The chain measures about 25". 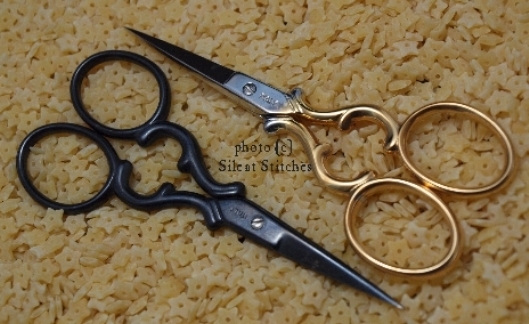 Overall size of the sheaths is about 2.75"
2 3/4" Scissors are included. Hot forged carbon steel, then nickel plated. Beautiful iridescent shades of blues, greens, purples and every color of the rainbow! Expect variations etc., keeping in mind the price. Titanium bonded: 3 times harder than stainless steel! Soft contoured bows...very comfortable to use! Fun pastel colors with white polka-dots! ~Sold Out~ We do not expect more at this time. 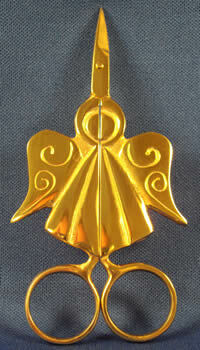 Metal Construction with Baked Enamel designs. Only a few left in BLACK only. 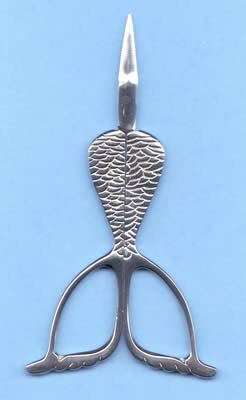 Click on the photo below to see more exciting Mother-of-pearl items from Kelmscott Designs too! 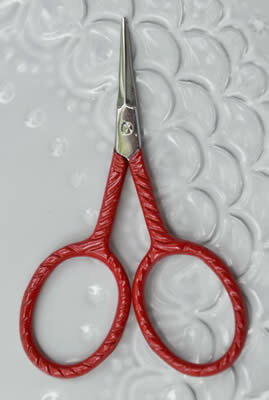 Exclusive Scissors designed by Kelmscott Designs! 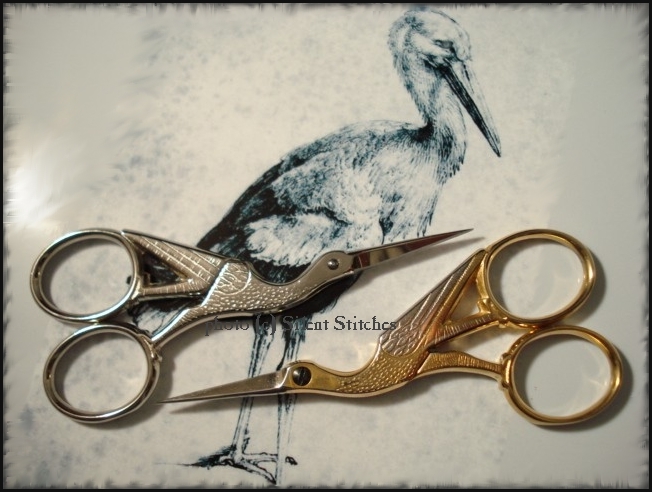 WOVEN Scissors by Kelmscott Designs! 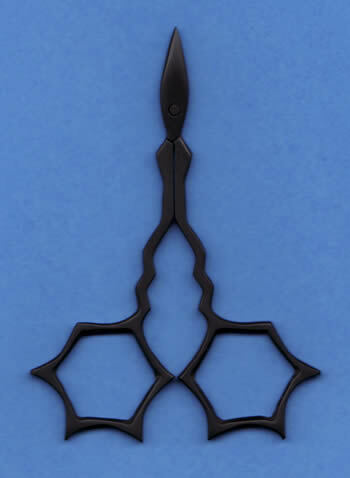 Winding vine with a sweet flower accent design at the pivot point! 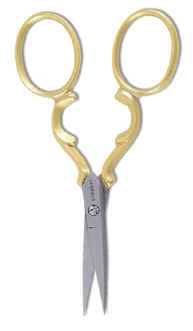 Gold Vineyard Scissors are also available in smaller 3.25" size! 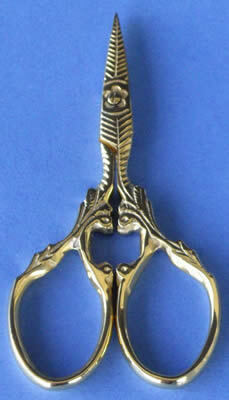 Cat Snips Scissors by Kelmscott Designs! 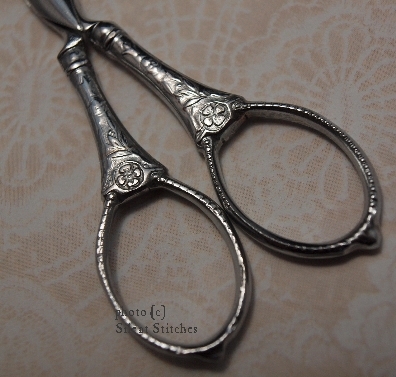 2.5" Storklette Scissors by Kelmscott Designs! Did you know that baby storks are called storklettes? 13 Color Choices!! Select your favorite or collect them all! 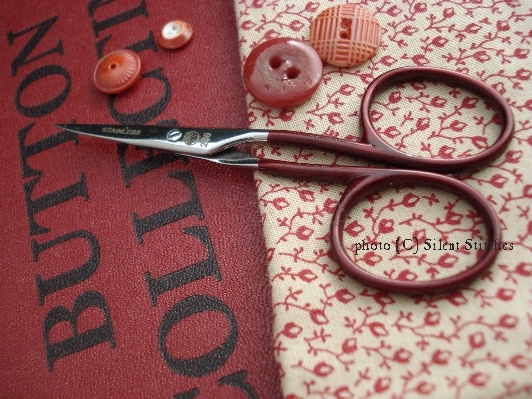 "WHERE IT'S" Ô ...from Silent Stitches. 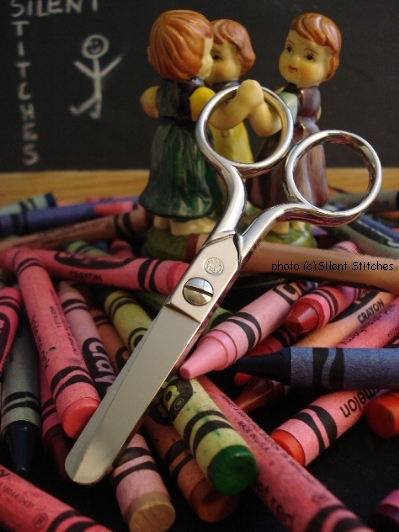 Always know "where" your scissors are! Fun to wear! Click on the above link to see what it's all about! 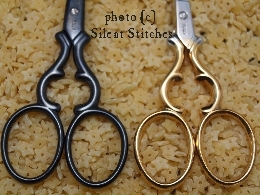 Necklace Chains or Ribbons in many Color Choices...perfect for all of your smaller scissors. 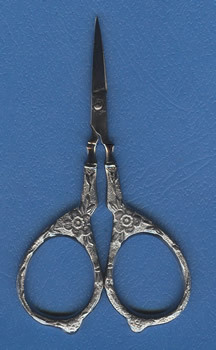 4" Hardwick Scissors by Kelmscott Designs! 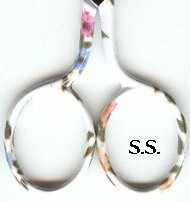 Long handles and short blades. 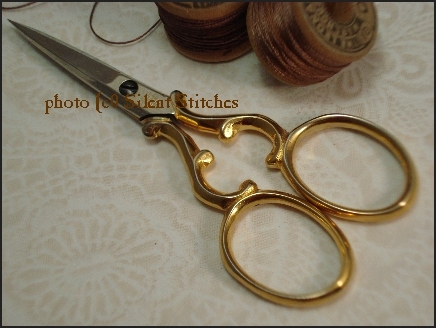 The needle minder for scissors lovers! Use it as a needle minder...or wear it! Another wonderful design brought to us by Kelmscott Designs! 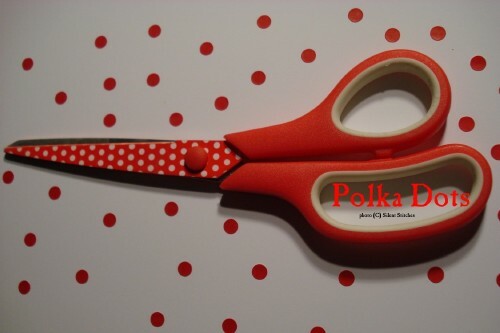 Paula promises more scissors shaped needle minders to come...so start your collection now! Hillier 4" Art Deco Style by Kelmscott Designs! 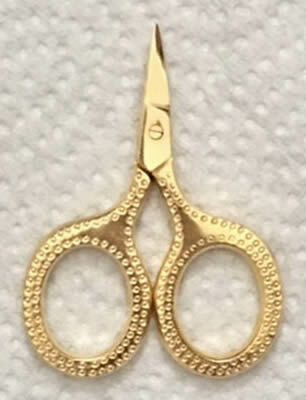 Unique & fun scissors....you'll want to collect them all! 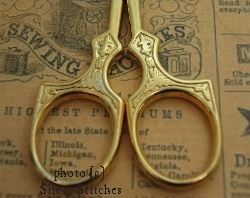 How cute are these twin cat scissors? 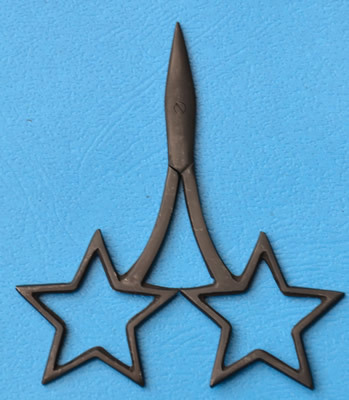 *Note: These came with an unpainted spot near the edge of the left bow. (See photo) If that is a problem, these may not be for you. 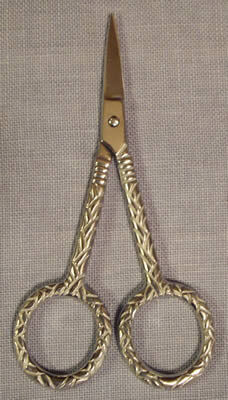 Tweezers can be found on the Needlework Tools page. Click here to go there! 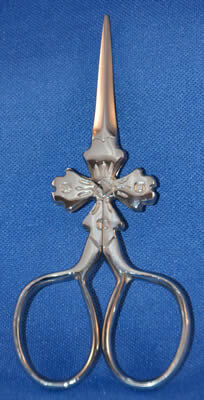 Tool-Tron's "Old Time Vintage Classic's Scissors Case"
Overall painted floral design with Tool-Tron logo on the reverse. 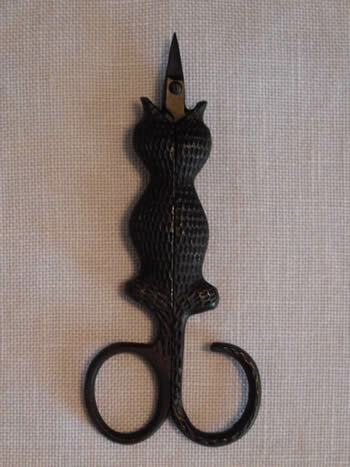 Zebra print leather scissors sheath included. 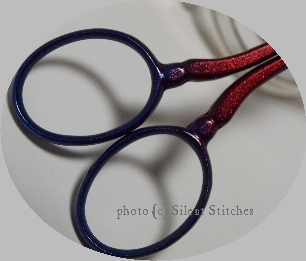 Quickly correct your stitching mistakes! 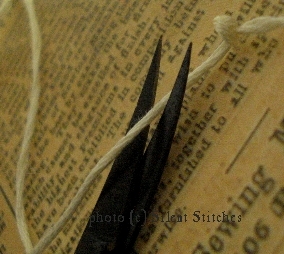 Notched blade slips under the stitch for precise removal with just a snip! 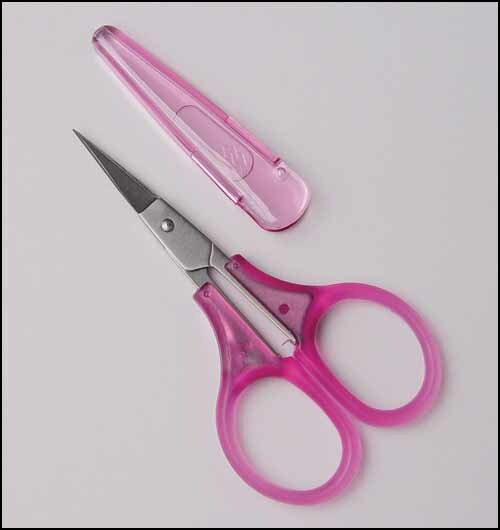 Handy Scissors...for all sorts of tasks! 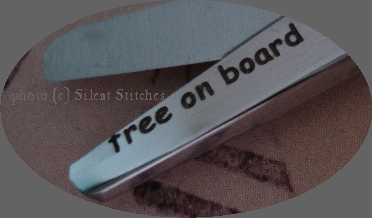 ...just press & snip for speedy thread removable! 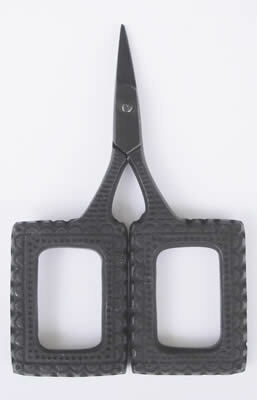 Perfect for cutting in tight places! For those of us who just have to fix the mistake! We especially like the deeper hook on these as compared to some. 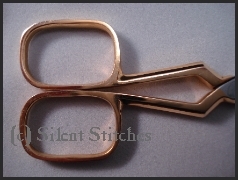 Excellent for precise stitch removal. 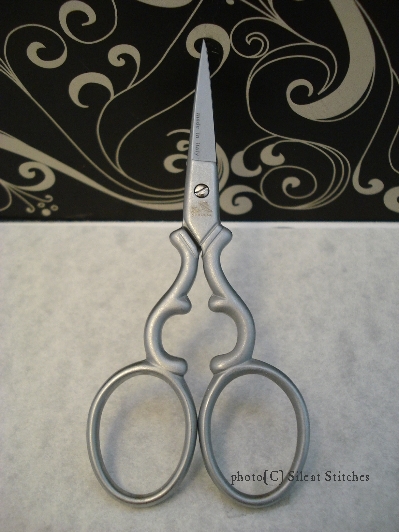 4" Serrated Blade Scissors with LARGE Bows! 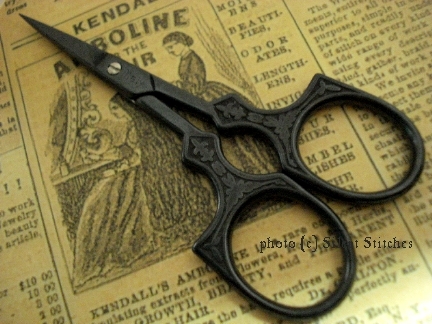 No-Frills *Gotta Have* Scissors Trust me...you need these! 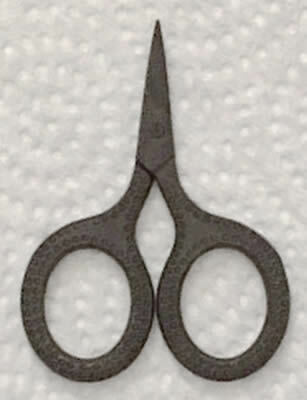 When these scissors landed on my desk, quite frankly I wasn't impressed. They were tossed aside and moved around the desk for several days. Then it happened. 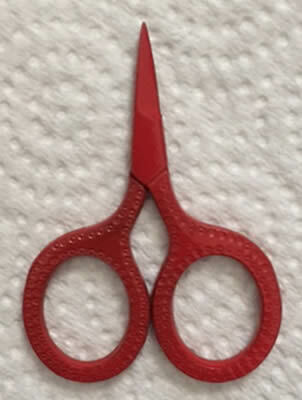 I needed a pair of scissors in a hurry and grabbed these. I think I heard angels sing when I cut the ribbon...no kidding. I actually felt a twinge of guilt for ignoring them all week. As you can see, there is nothing fancy about them. 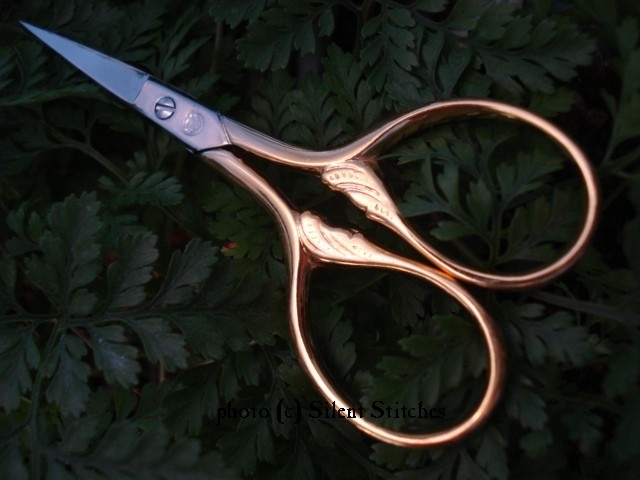 The finish is iffy, the quality is utilitarian at best....but boy can they cut! The serrated blade allows them to cut with such precision. 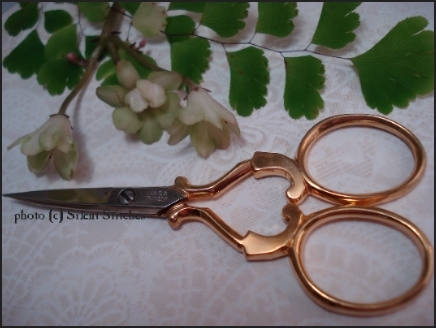 I have fallen in luv with these scissors. 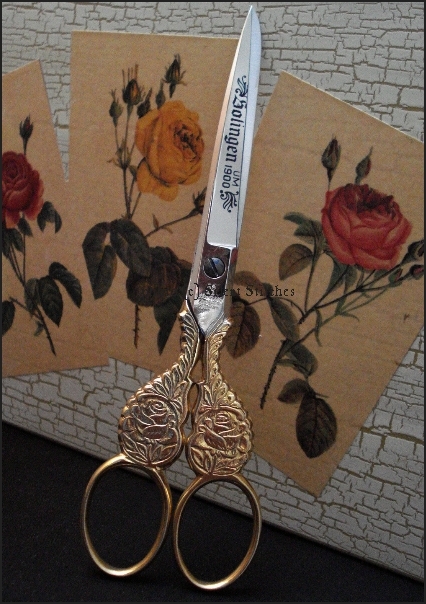 So here they are: THE Best-Worst scissors you will ever own! 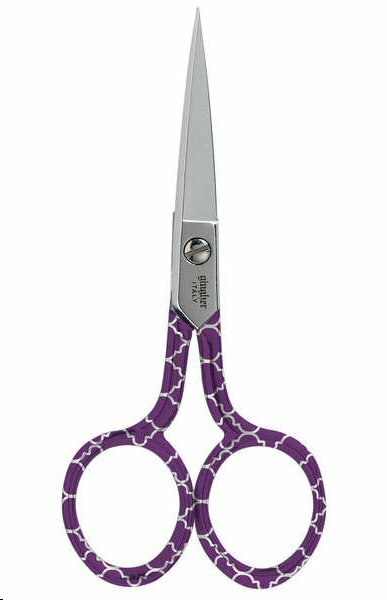 Get yourself a pair of these No-Frills *Gotta Have* Scissors, and like me, you'll wonder how you ever lived without them! 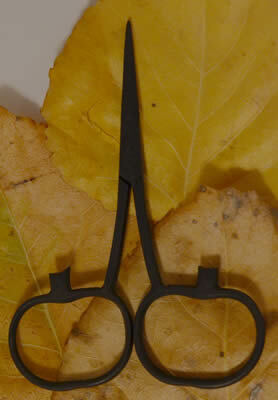 © SLIP-N-SNIP ...the original folding scissors! 101 uses! 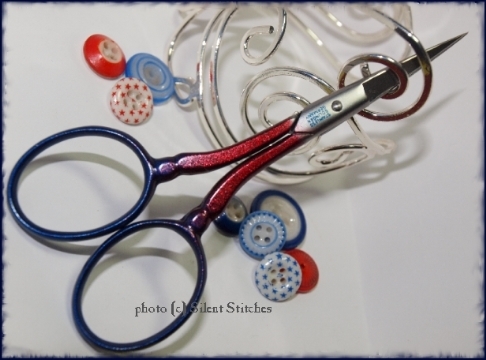 Sewing, Needlepoint, Embroidery, Fisherman tackle boxes & more! Packaged as shown below, in a gold-foil gift box. 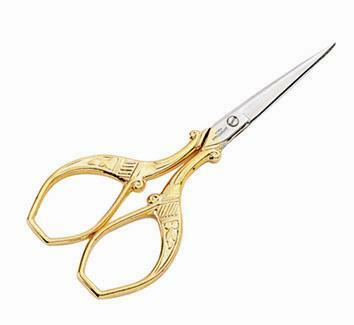 Needlepoint-tipped Folding Scissors with Gold Plated Handles ! Packaged as shown above, in a gold-foil gift box. Gift Boxed as shown above. Comes to you in an attractive embossed gift box. Ready for gift giving! Retractable 58" Tape Measure. Color: Black with silver embossed floral design & red push button. Extremely sturdy construction. Meant to be used. Would make a lovely gift! An impressive set for the price! Comes to you in an attractive foil embossed gift box. Ready for gift giving! Retractable 58" Tape Measure.  Color: Cream with copper embossed floral design & contrasting push button. Magnetic back. Note: Rose Gold colored finish. NOT genuine gold. Sharp & precise! Will cut through 4-8 layers of cotton fabric without slipping! 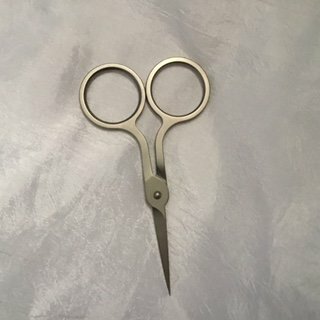 These sure are sweet little scissors! Super sharp and precise fine tips! 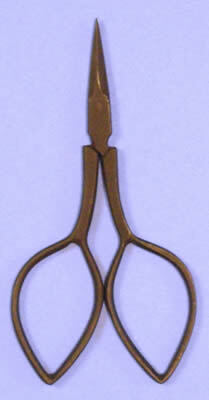 Compact size, measuring just 3.25". Stainless steel, straight blades with a snap-on safety sheath/cap. We were very impressed with the quality construction and performance of these handy little cuties. ...don't forget to buy an extra pair to keep in your purse! 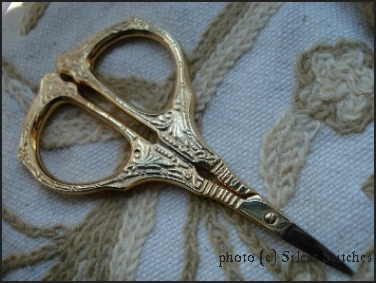 Fantastic fabric scissors! A serrated edge prevents fabric from slipping while cutting. Effortlessly cuts through multiple layers. Precision tips, perfect for detailed work. The One Size Fits All Scissors! 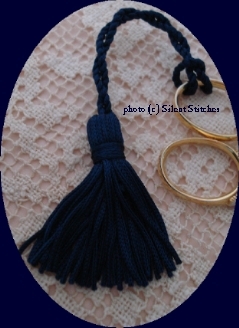 Fits LEFT or RIGHT Hands ~ Fits SMALL or LARGE Hands! Precision blades. Use for cutting all sorts of materials. 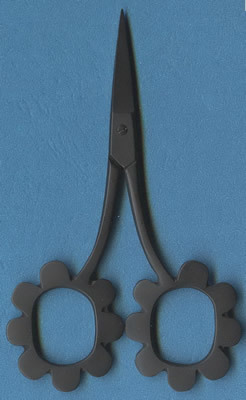 Flower Handled Scissors with a Flowerpot holder. Very well made! 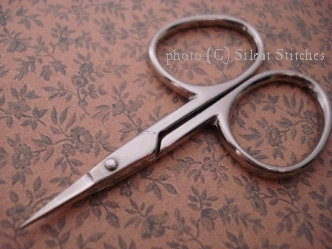 Scissors cut sharply too! Please let us select one for you. Red with WHITE POLKA DOTS! 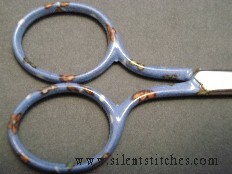 8.5" Paper Shears ...just for fun! 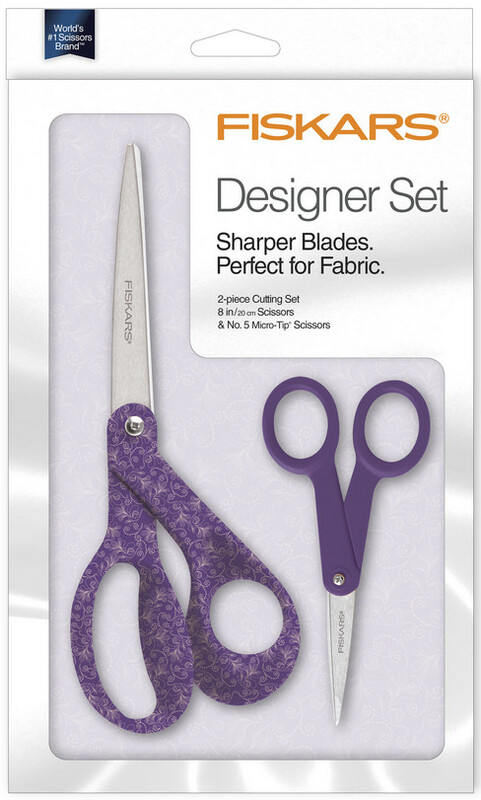 We tested these and they did not perform well when cutting fabric. 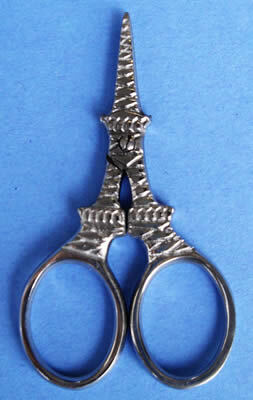 Cute scissors to keep on your desk! Not enough Scissors? We agree! 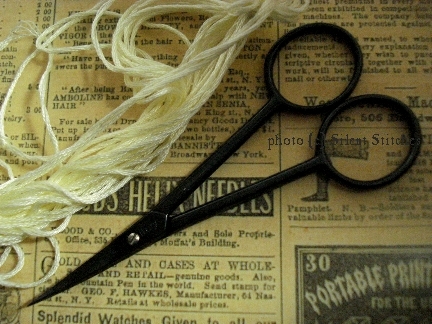 There are more scissors on the next page! These are individually handmade by skilled artisans. Limited production each year. If you appreciate old-world craftsmanship, these are for you. Suitable for a King or Queen! Currently available in CHROME only. Chantilly Chrome for Silver lovers! Warning! DO NOT COPY OUR PHOTOS OR DESCRIPTIONS FOR ANY REASON. COPYRIGHT POLICY STRICTLY ENFORCED. Not for personal use on facebook, pinterest, blogs, or any other social media! © 1998-2018 Silent Stitches tm. All rights reserved. This website or any part thereof may not be reproduced in any form for any reason.